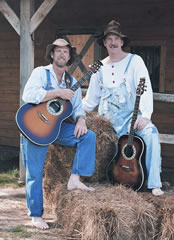 This back-woodsy duo brings unique talent of vocal harmony and guitars blended in hilarious fashion with their own brand of dialogue. Its an hour or more of side-splitting comedy thats guaranteed to respectfully bust up any formalities. Lubus and Ezra have been highlighting banquet dinners, conventions, annual meetings, and city celebrations, and their popularity continues to grow. Lubus and Ezra are committed to the values of family and rural America and they are committed to premier entertainment thats affordable and refreshingly clean.